Winter has me craving comfort and comfort food. My salvation can be found on a plate at Pig Iron BBQ. 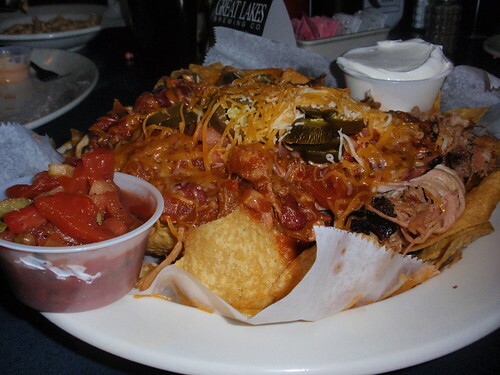 This perilously piled plate includes: lots of thick house made tortilla chips, homemade (vinegary) salsa, sour cream, chili with beans, jalapenos, cheddar cheese, beef brisket scraps and pulled pork. On the surface this may sound and look good. The concoction certainly tastes good. This can serve as a meal for one or two people. The tipping point and what warms my heart like the Grinch at Christmas is the price – at happy hour, these nachos are 1/2 off! Happy Hour typically starts at 2 PM during the week. So I can have these beautiful nachos and a large draft beer for less than $10 with tip included and skip the bar before the masses come in. 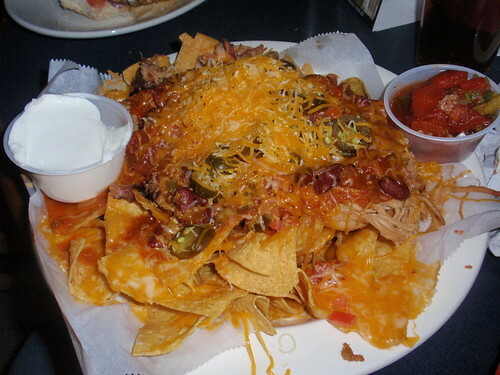 These nachos can nip the blues. As of for the rest of the menu, it is decent, with the pulled pork sandwich being the best bet of the bunch. Pig Iron is a spin off of Old Bag of Nails and includes some of the menu items from their sister restaurant – namely the gigantic fish sandwich. Here are couple bits of Pig Iron lore: The building used to be a McDonalds and was one of the few Columbus area Golden Arches to close….ever. When the restaurant first opened the neighbors were not so happy. Typically Clintonvillians offer sacrifices to the restaurant gods to bring us eateries. However the gods can be fickle. When they brought forth Pig Iron it came with a big pink pick up truck in the front as art. Art lost out to profit and community. The truck is now less conspicuous but there is still plenty of pink on premises to keep spirits warm. This entry was posted on December 7, 2009 at 9:07 PM	and is filed under restaurants. Tagged: Pig Iron BBQ. You can follow any responses to this entry through the RSS 2.0 feed. You can leave a response, or trackback from your own site.